After a somewhat slow year in terms of brewing, I got the urge to challenge myself and ferment something outlandish, something I've never made before. In fact, it's possible I may be the first to ever brew with this particular set of ingredients. I searched the internet for inspiration but couldn't find the exact recipe I was looking for, so I wrote one from scratch. Sure, there are blueberry wines out there. There are so-called acerglyns, or maple meads. I even found a wnery in Michigan that combined the blueberry and maple flavors. But what ingredient could I add to make it really taste like blueberry pancakes? Flour? No way--I imagine that would take forever to clarify and it would probably clog my auto-siphon. Buttermilk? No, that contains (or at one time contained) lactic acid bacteria and I don't want the trouble of monitoring malolactic fermentation, something I have yet to master. I should also mention that I'm fermenting this at work, so the available tools and supplies are limited. How about milk? Yes, of course--in Central Asia there is a drink called koumiss, which is made from fermented mare's milk. There is also a mead variety known as a lactomel, which is supposed to have a very unique flavor. The key is doing something about the lactose in milk, which yeast cannot metabolize. I'm using Lactaid, which contains lactase, an enzyme that breaks up lactose into its constituent parts, the simple sugars glucose and galactose. I haven't found any mention on the internet of anyone fermenting honey, maple syrup, blueberries, and milk all at once. Feel free to correct me if I am not the first. I poured 1½ gallons of Lactaid into each fermenter, followed by a bottle of Naked Blue Machine juice (it contains mostly blueberries but also has some banana, which I know to be an excellent wine ingredient). Even though the bottle was small, it added a significant blueberry flavor to the milk. In order to dissolve the honey without heating the milk, I poured some milk and honey back into the carton and shook it vigorously before pouring it back into the fermenter. I realized that this method would not allow me to accurately measure the amount of honey I was using but I don't care; the specific gravity value is what really matters. I tried to add roughly equal amounts of honey and maple syrup. By the time I reached about 11% potential alcohol, I had only used about a pound of each, which was less than I expected. Milk by itself probably has a higher specific gravity than water but I was unable to measure it because the liquid was not deep enough for the hydrometer to float. I expect that, as a result, the fermentation will cease before the SG reaches 1.000, leaving the state of the yeast unknown. I'm planning to stabilize the mead anyway so I can sweeten it with maple syrup, so this isn't much of a concern. I added acid blend one teaspoon at a time until the pH reached approximately 4.4 (my pH meter is due for a calibration, so this figure may not be accurate). The acid should also help the milk form curds and clarify more rapidly. Each time I sprinkled acid on the surface it turned a vibrant purple color. I've always wanted to understand why acid brings out the color of the fruit. Next, I dissolved 1½ tsp of Yeastex and approximately 1/24 tsp of potassium metabisulfite (I should have brought my digital scale) into some filtered water and stirred that into the must. Then I added a package of fresh blueberries and tried my best to crush them against the side of the fermenter. I sealed up the buckets and left them overnight to allow the sulfite to bind with the sugars. I thought I had some Lalvin EC-118 yeast in the refrigerator but all that was left was some D47, so I used that instead. This was my first time using Go-Ferm nutrient. I dissolved 2 tsp of it in some warm, filtered water and added the sachet of D47. The yeast started to become active within 15 minutes, at which point I dissolved a packet of raw sugar in some more filtered water and added that. Within the next half hour, the yeast began producing tiny CO2 bubbles. I dissolved two more sugar packets in some more water and stirred that into the starter. A few hours later, I did the same with four packets of sugar. The starter never formed a cap but it was bubbling like a freshly opened bottle of soda. About 6 hours after rehydrating the yeast, I poured half of the starter into each fermenter. The next morning, I didn't see any signs of activity. At first, I thought the yeast had died due to some factor I had overlooked but then I realized the seal on these 2 gallon buckets was not airtight, despite having a pair of clamps on them. I went to the store and picked up some chip clips. Once the lid was firmly sealed, I started seeing plenty of CO2 pass through the airlocks. In fact, by the end of the day, the mead had foamed up so much it was oozing out of the airlock. I need to stop being so greedy and leave more headroom in the fermenters. At least there's no question about the yeast's viability. Must be the Go-Ferm. At this point, it tastes sort of like blueberry yogurt with a grainy mouthfeel. I added a dash of maple syrup to the sample and then it totally reminded me of blueberry pancakes. I'll definitely be sweetening it with maple syrup after fermentation is complete. I scooped out some of the curds and stirred up the rest. The curds have a grainy texture and a very yeasty flavor. Later in the day, I dissolved about ⅜ tsp Fermaid K in some filtered water and stirred it in. I also put my thumb near the lens like a pro. Most of the sweetness has disappeared, leaving the flavor rather bland, though it still has a nice blueberry aroma and a pale mauve color. With a dash of maple syrup it was delicious and very pancake-like. I will definitely be sweetening it this way after it's stabilized. After sitting in the fermenters over the weekend, the yeast activity appears to have died down. Much of the yeast and curds have sunk to the bottom, leaving a somewhat translucent liquor with macerated blueberries floating on top. The blueberries had surrendered some of their pigment to the liquid. I decided this would be a good time to rack the mead into glass jugs. I scooped out as much of the blueberries and curds as I could so that they wouldn't clog the siphon. Without the milk solids in suspension, the mauve color has given way to more of a peach color. The flavor is milder, too. It used to taste like a milkshake but now the flavor is cleaner but less remarkable. I racked each bucket into a glass jar, leaving behind several inches of milky sludge. I had originally thought I would have so much volume that I could keep the excess in a half gallon growler and use it to top off the gallon jugs after the next racking, but there was just enough wine to nearly fill the jugs without pulling up too much yeast and milk solids from the bottom. I dumped the remaining sludge outside rather than risk clogging the office sink, which is already fraught with plumbing issues. The second hydrometer measurement read 1.030 which has to be incorrect. It's higher than the reading last week. Maybe the hydrometer stuck to the side of the container due to surface tension. I'll have to give it another try tomorrow. If fermentation actually has stopped at 7.5% alcohol, then I guess I'll just bottle this batch as the "girly drink" version. There does appear to be a difference between the two, at least visually. One is slightly more purple than the other. It was evening by the time I finished racking and the fluorescent lighting was inadequate for a photo. I haven't had time to check the specific gravity but the two secondaries look more similar today, both more of an orange hue than before. One is slightly darker than the other. That's the more potent of the two. The liquid is getting a little bit clearer. There are still tiny CO2 bubbles floating to the top, so either there is still a minuscule amount of yeast activity or it's just dissolved CO2 coming out of suspension. Giving the jug a quick spin sends up some larger CO2 bubbles from the lees. Once it clarifies some more, I'll rack it and add some stabilizer. I wonder if I should add some more whole blueberries at that point. The higher alcohol content will extract more color and flavor from the blueberries, which seem to have disappeared after primary fermentation. I think I would soak the blueberries in a sulfite solution first so that no wild yeast or bacteria is introduced. That would also help the stabilizer put an end to any further yeast activity. After stabilizing it, I should be able to safely sweeten it with maple syrup without a risk of renewed fermentation. I'll need to be careful not to overdo it. Too much maple syrup and it could not only be cloyingly sweet but it would definitely overpower any of the remaining delicate blueberry flavor. I broke the airlock on the second jug while trying to remove the stopper because I applied too much torque. Stupid rubber stopper. The silicon ones are better, if you can keep them from popping out on their own. I'll have to grab a new airlock when I go home tonight. 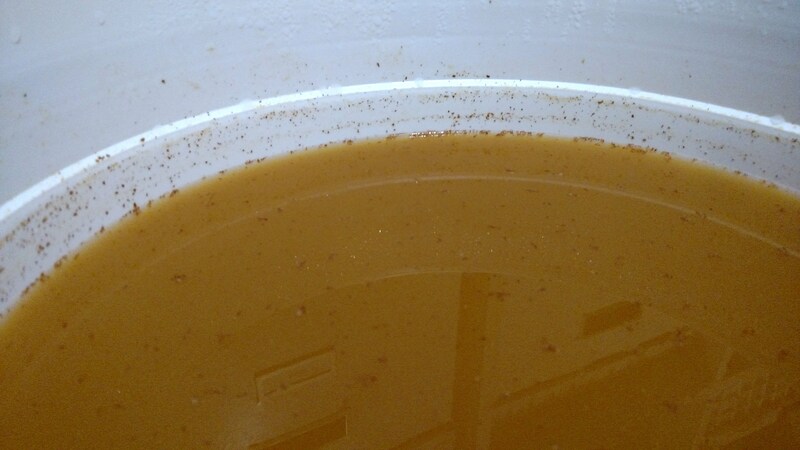 I racked the mead into fresh jugs, leaving behind some thick, milky sediment. Most of the blueberry and maple syrup flavors have disappeared but it's obvious that this was made from a dairy product. It a slightly sour flavor, similar to yogurt. The dairy flavor might add some complexity to the blueberry pancake idea but by itself, it's not terribly interesting. I'll definitely steep some blueberries in the secondary and sweeten it with maple syrup at the end. The color mellowed out a bit, too. I wanted to add sulfite and stabilizer, but the recommended amounts were for 6 gallon batches of wine. What I did was dissolve ¼ tsp potassium metabisulfite and ¼ tsp sodium benzoate in 1½ cups of water, then pour out a quarter cup of solution into each jug and stir it in. Once it's stabilized, I'll add some Trader Joe's freeze dried blueberrries, which Jed picked up. These are unsweetened and unsulfited and contain no preservatives, which makes things a lot simpler. The specific gravity of both jugs reads 1.002. It must be a change in temperature. No more tiny bubbles, so that must be a sign the yeast are dying off. I still didn't see any bubbles arising from the mead, so I topped up the jugs with some of the dried blueberries. They are both producing lots of bubbles now, so I guess that means some new yeast had hitched a ride on the blueberries or the dormant yeast in the mead woke up and started eating this new source of sugar (indicating the stabilizer hadn't had enough time to do its job). Oh well, I guess this is going to be some boozy mead. I wonder what's going to happen when I add the maple syrup. Finally, there's the color I was looking for. The berries are still bubbling but not as much as yesterday. I wonder how vibrant the color would be if I scooped out the berries and put new ones in. The berries looked like most of their color had been stripped away, and the color of the mead didn't seem to have changed much since Friday, so I carefully picked the little sonofabitches out one by one with a tiny spoon, like the slowest, most tedious game of Hungry Hungry Hippos ever played. Then I dumped another bag of blueberries into each jug. That should make it nice and purple. I squeezed some booze out of the berries I picked out, mixed it with a splash of maple syrup, and tried it. I guess if a blueberry pancake were a wine, this is what it would taste like. The milk definitely adds an interesting dimension to it. It's kind of gross to think I'm drinking month-old milk that's been sitting at room temperature. I wonder what the expiration date was on the Lactaid. The mead is definitely darker and more purple now. I'd take a picture but at this time of evening my phone's camera makes everything look cyan and I don't have the time or patience to play with white balance settings like I know what I'm doing. Not going down that rabbit hole tonight. I actually remembered to take a photo while the natural light was decent yet my phone insists on making everything cyan. By using the "sunset" preset I was able to get something closer to normal, although the color in real life looks so much better than these pictures. The berries are starting to look pretty washed out again, so this is probably all the color I'll get out of them. Oh well, if I looked at this and someone told me it was blueberry pancake-flavored I would believe it. Maybe early next week I'll rack them and get the berries out of there. This one looked kind of cool with the light shining through it. Yes, I know ultraviolet light spoils wine but I only brought them out for a few minutes. Ordinarily, I keep a paper bag over them. Jed and I racked the mead into new jugs, leaving the berries behind. Since there was quite a bit of head space, I sprayed some argon in the top. We tried a sample, mixed with a little maple syrup, and it was delicious. This is the stage at the end where I become either lazy or frustrated and document very little information, if any. Yada yada yada, we filtered the mead and bottled it. We had to filter it through coarse pads, followed by fine pads, because transporting the jugs in the car stirred up all the crap on the bottom. When I set up the Mini Jet, I must not have screwed the plates on correctly during the first pass because it started spraying out the bottom and we lost at least a quart of mead. This time, the lack of documentation can be chalked up to frustration. I was so mad at the Mini Jet that I didn't bother measuring specific gravity when we added maple syrup to sweeten it. We basically kept adding it in small doses, stirring it with the wine thief, and tasting samples as we went. Eventually, we reached a decent balance between alcohol, acidity, and sweetness. We ended up with a little more than six bottles because of the leaking filter. I'm really starting to be convinced that batches smaller than three gallons are not worth the time and effort. Last night it tasted pretty good but today we had the chance to taste it cold. There was a little bit of volume left over that wouldn't have filled a wine bottle so we put it in the fridge. Chilling this stuff brings out the creaminess of the dairy component. It's delicious now. This being my first try at a lactomel, it makes me wonder what a pure milk mead with some residual non-fermentable lactose would taste like. I'll have to try making that sometime in the future. Afterword: Jed and I were sitting in the living room when we heard a loud pop and what sounded like projectile striking the wall. I first thought it was vandals throwing something at our house but then I could hear liquid dripping somewhere indoors. I ran to the bedroom and found one of the bottles open, with the cork on the opposite side of the room and blueberry pancake milk mead everywhere--on the floor, on the wall, everywhere. We're really lucky the glass didn't shatter. That has happened before in the kitchen and it was a total disaster to clean up. We're also lucky no one was standing in the cork's trajectory when it happened. I immediately texted my former co-worker, to whom I'd given a bottle as a going away present. "Watch out!" I warned, but it was too late. It had already exploded in the trunk of his wife's car the other day. At least he had a good sense of humor about it. "ROTFLMAO" was his response. Lesson learned: Never, ever, ever sweeten a young wine. Even with stabilizer and sulfite, those yeast cells can lie dormant for weeks and then wake up and start eating sugar and producing CO2 again, slowly, insidiously, until the bottle bursts. The remaining bottles had to go outside ASAP. I put on some eye protection, a jacket, and gloves and placed them carefully in a big metal pot, the whole time expecting one of them to explode in my hand. I managed to get them outside and uncorked them, releasing a volcano of fizzy purple booze from each one. You will be relieved to know that no mead went to waste. We got to work pouring ourselves a glass and the rest we sealed with a stopper and polished off the next night with some friends. Crisis averted.